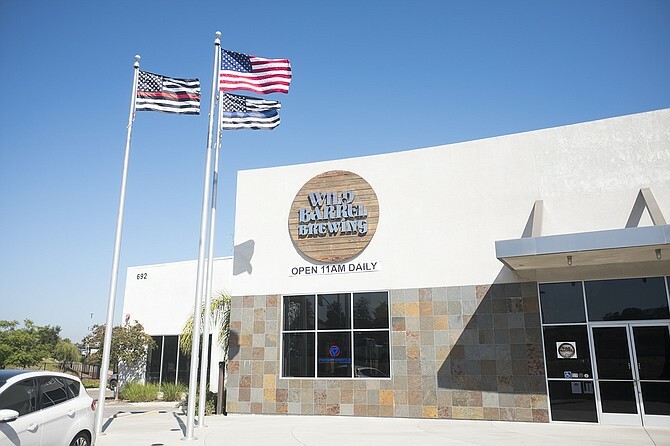 Wild Barrel Brewing opened Autumn 2017, in a building it shared with SoCal Batting Center, a business whose batting cage offerings include a pro-style pitching simulator: a video pitcher winds up and delivers a pitch in sync with the pitching machine, mimicking game action. A large, barrel-shaped alcove sits at the center of the tasting room, while regular-sized barrels sitting across from the bar signal a future filled with aged sours, stouts, and wild ales. While those beers develop, fresh beers pour daily at this large space. Wild Barrel’s flagship Prince of Dankness is a potent double IPA made with New Zealand hops. Space Juice is a slightly juicy, hazy IPA boasting orange and tangerine flavors of the Mandarina Bavaria hop, an aromatic varietal that’s been trending with local breweries.